Share direct access to your Seizure Tracker account through the Valet system! Share access to a Seizure Tracker basic user account to one or more management accounts. Valet key can easily be created and shared via an email invite from the SeizureTracker.com user interface. Access levels can be determined per each available tool including recording seizures. Seizure Tracker users can share access from a basic account to a management (or multiple management accounts). This can come in two household families, when sharing real time access with your doctors or enhancing communication with your school. - Share with your doctors, nurses, teachers, etc. Request valet keys from your patients and have real time acces to their Seizure Tracker data and create reports. - View multiple patient accounts through one Seizure Tracker management account. Provide access to multiple care managers with full (or limited) event and therapy recording. Create reports to share with families or the resident's medical team. 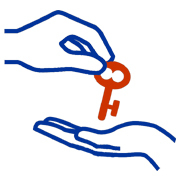 Provide access to multiple teachers, adminstrators and school nurses through sharing valet keys. Create or log into your Seizure Tracker account and activate the valet system through your account settings page. Start sharing valet keys!